Eating healthy during pregnancy is all about making the right decisions. Pregnancy diet is almost the same as your everyday diet. 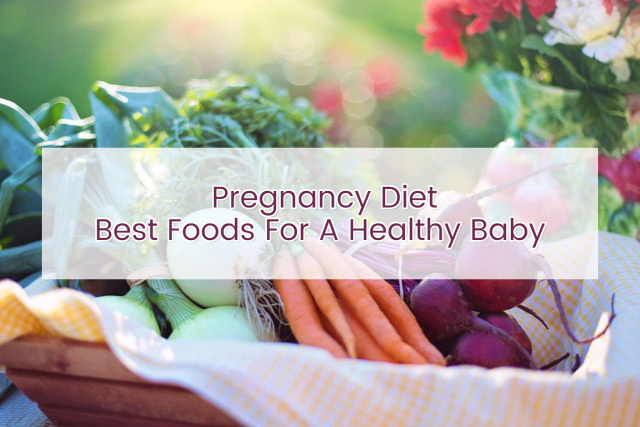 A balanced diet with a little alteration to suit your specific requirements is an apt pregnancy diet. Now you are not only taking care of your body but also catering to a child who is grumpy and hungry all the time. Always remember you are eating for a growing fetus also. Here we have a list of pregnancy super foods that pregnant women must eat. Foods to avoid during pregnancy follow after that. Some dos and don’ts during pregnancy! No vitamin is more important than folate or folic acid in pregnancy. Load up on legumes, dried beans, citrus fruits, juices, peas, leafy vegetables, poultry, peanut, pork, and fish. Why is it important to take folic acid during pregnancy? If you consume folic acid in copious amounts, the chances of neural tube defects decrease by 70 percent. Folate during pregnancy prevents Spina Bifida and abnormalities of the spinal cord and brain. How much is folate requirement in pregnancy? Pregnant women need 600 micrograms of folate in the first trimester . But folate from food is not absorbed well, so doctors also prescribe a tablet of folic acid that you have to pop in. Folic acid is the synthetic form of folate, and its daily intake also reduces the chances of premature delivery. Caution: Overdosing of folate leads to toxicity. You will consume sufficient amount of calcium by consuming low-fat dairy products. Dark green vegetables like broccoli and kale, orange juice and soy products also have a lot of calcium. Why take calcium during pregnancy? You need a lot of calcium during the second trimester, especially because, during this period, his bones and teeth will be forming. How much calcium is required during pregnancy? Your daily dose of calcium should be 1200 milligrams in the second trimester . Eat lots of beetroots, bone marrow, guavas and other iron-rich fruits at least three servings a day. Why take iron during pregnancy? Iron is just as important. Iron helps in the synthesis of a protein called hemoglobin present in red blood cells. It is the protein that carries oxygen to tissues. During pregnancy hemoglobin levels fall. Pregnant women taking iron rich food will help synthesis of more hemoglobin. How much is iron requirement during pregnancy? If you aim for 30 milligrams in a day , your blood volume will increase by 50 percent. If you solely depend on food, your iron levels will stay low as iron is difficult to get absorbed. Pregnant women need iron supplements. Vitamin C also enhances iron’s absorption. Pregnant woman must take Vitamin C along with iron-rich food. Zinc is best absorbed from seafood. Why take zinc during pregnancy? Less intake of zinc can lead to premature delivery, congenital disabilities, and limited fetal growth. How much is Zinc requirement during pregnancy? Pregnant woman zinc requirement is 15 milligrams per day . Best fiber-rich foods for pregnant woman are chia seeds, cereals, and carrots. Pregnant women must take every day around two to three servings of fiber-rich food. Avoid refined carbohydrates. Why take fiber during pregnancy? Fiber is essential as it pertains to all your pregnancy constipation complaints. It makes you feel fuller for a longer time. Bowel movements improve, and pregnancy constipation relieves. How much fiber is needed during pregnancy? If pregnant woman takes 25-35 milligrams fiber per day, it can prevent hemorrhoids. You can obtain it from fatty fish, such as salmon, orange juice, eggs and of course- sunlight! Why take Vitamin D during pregnancy? Who does not need vitamin D? Vitamin D helps in everything from skin formation to hormone synthesis. You and your baby need it equally well. How much is vitamin D needed during pregnancy? During pregnancy, pregnant woman requires 600 international units of Vitamin D .
Good sources of protein include Lean meat, poultry, fish, lentils, eggs, dried beans, and peas. Tofu and cottage cheese are the best dairy products for pregnant women. Peanut butter is also super food for pregnant women. Nutrient-dense foods also include yogurt, chicken, beef, and eggs. Why take proteins during pregnancy? Proteins are not only needed for gym lovers for muscle building. Every cell every second every day and at every stage needs protein. Proteins are vital during pregnancy. Your baby takes all the nutrients from you. Proteins are essential for baby’s growth and development. When thousand of things are happening inside your body during pregnancy, you need to take extra protein. How much protein does a pregnant woman needs during pregnancy? A pregnant woman requires 71 grams of protein in a day for the development of the baby. During pregnancy, protein intake will also depend on your muscle mass. If you have less muscle mass, then your pregnancy protein requirement will be higher. Read more: Can I eat fish while pregnant? Good sources of Omega 3 include flaxseed oil, fatty fish like salmon, walnuts, and omega three fortified eggs. Why take omega three fatty acids during pregnancy? A diet rich in omega three fatty acids boosts your baby’s brain and neurological development. This pregnancy superfood makes your baby’s memory, vision, and language comprehension better. It also reduces postpartum depression. Pregnant women should avoid fishes like shark, swordfish, king mackerel and tilefish. They are rich in mercury. Fishes like Atlantic mackerel, herring, sardines, light tuna, and anchovies are the best food for pregnant women. One can never get enough of fruits and vegetables so load up on them as much as you can. Your meal should be rainbow colored and should include 5-10 tennis balls servings of fresh produce . They are required in second and third trimesters. Whole grains can include oatmeal, brown bread, rice, whole wheat pasta. Why eat whole grains during pregnancy? Pregnant women should eat whole grains. It is like a super food for pregnant women. Whole grains are significant sources of energy. It helps you stock up on carbohydrates. You will have your stomach filled. This will prevent feeling hungry all the while. Whole grain is a pregnancy food that will help you gain weight gradually. Food for pregnancy weight loss also includes whole grains. Whole grains have fiber and iron. Fiber keeps indigestion and bloating at bay. Fiber also helps in the production of Vitamin B12. As fiber doesn’t allow food to pass rapidly gut flora acts on it increasing the production of cofactors and vitamin B12. A pregnant woman should aim for three to four servings of dairy foods a day. Milk, yogurt, and cheese provide excellent dietary sources of calcium, protein, and vitamin. If you consume alcohol during pregnancy, it can pass on directly to your kid via the umbilical cord. Alcohol leads to fetal alcohol spectrum disorders. It is a broad disorder that includes physical problems as well as problems in learning and behavior. Alcohol also causes infertility in women. A pregnant woman must not consume alcohol during pregnancy. Even though fish is excellent but fish with mercury is a dangerous food for the pregnant woman. Mercury can pass through the placenta. It is hazardous for the baby’s brain, nervous system, and kidneys. Can I eat fish while pregnant? Seafood has recently got approval from The American Journal of Clinical Nutrition. It mentions that eating fish and shellfish during pregnancy is good for baby’s brain. But there is a guideline that the fish should be low mercury fish. Pregnant women should stay away from unpasteurized food like unpasteurized milk. As pregnant women might fall sick and get toxoplasmosis caused by a parasite and listeriosis caused by listeria bacteria. Listeriosis causes stillbirth, miscarriage, preterm delivery, and illness or death in newborns. If a pregnant mother consumes raw meat, then she can get toxoplasmosis. She can pass it onto her child. It causes severe problems like blindness and mental disability. Pregnant women must refrain from eating raw fish such as sushi, sashimi, and ceviche. Even undercooked shellfish like mussels, scallops, and clams are foods not suitable for pregnant women. A pregnant woman should not eat anything raw except vegetables and fruits. Eating raw eggs carry the risks of having bacteria like Salmonella and E Coli giving you food poisoning and making you all the sicker. So pregnant woman should not eat salads like Caesar salad dressed with raw eggs. Pregnant woman should avoid eating raw cookie dough, cake batter, poached eggs and unpasteurized juice. Eating well during pregnancy is essential. Keep yourself hydrated. Drink a lot of fluids. Workout and run while pregnant for maintaining your health during pregnancy. Foods for healthy pregnancy will become the foods that help in pregnancy weight loss. It is the first step towards being a responsible parent that you feed yourself the right stuff during pregnancy. A significant part of your child’s body makeup will only depend on what you eat during pregnancy. Keep these things in mind while you plan your pregnancy diet chart.